After a long, draining growing season and disappointed with several underperforming storage crops, I had just about decided against extending the CSA season. But there is still ample food to be found on this farm, and many of you have expressed your interest in getting more. So, let’s do it! Just as in years past, we will do three more Friday afternoon deliveries: November 20, December 4 and 18. We will have a pick-up location in the Highlands and on the East End. Cost is $100. Let us know if you are interested. Every October, we conclude nine months of planting with one final crop. We break up a couple thousand bulbs of garlic, and each individual clove gets set into the ground to become its own bulb next June. This week, just before the big rains arrived, we stuck the last of some 12,000 cloves into the soil. In the coming weeks, we will cover this garlic ground with a thick layer of straw mulch and leave it alone for many months to let the garlic do its slow, quiet, irrepressible thing. Where but a short time ago the stalwart crops of summer stood, the soil surface is now bare—but not for long. Bare soil is an erosion catastrophe waiting to happen, so we plant cover crops to keep this precious matter in place. Soon these fields will be covered by a vibrant green carpet, ready to weather the winter. More work remains, of course: the deer fence project, stalled out for the last six months, needs to be completed; firewood needs to be cut, split, and stacked; the chickens don’t hibernate; a smorgasbord of little things, not urgent enough to attend to during the frenzy of summer, need to be addressed now. But, with the wild saga of 2015 in the books, we happily enter into the season of slowness, contemplation, healing, planning, and gratitude. Thanks for joining us for another exciting CSA season. Thanks for your faith in us, and thanks be that we made it the distance again, that the promise of tiny seeds came true, that the earth provided for us, that the elements did not so conspire against us as to thwart our mission. Despite the obstacles—which are predictably plentiful—it has been another year replete with brimming boxes. If I were running for public office, I might tout all my impeccable virtues that guarantee perennial greatness. The truth, however, is that we accomplish nothing significant without each other. 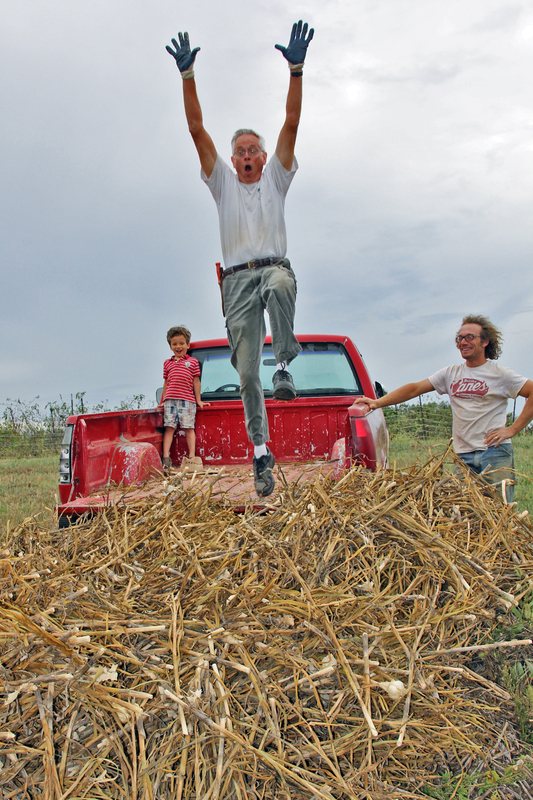 This farm is a community effort, a product of so many selfless, unseen, unsung contributions. A Place on Earth CSA is 11 years old now, and every year we more and more embody the spirit of Community Supported Agriculture. Bushels of thanks for all the helping hands, minds, and hearts that keep us growing, through sick children, flooded fields, broken arms, etc. Thanks for the various ways in which you have supported us and enriched and enlivened this community. In a world wobbling from great distress and disease, we are blessed to know the oasis of cooperation, compassion and consciousness that is this community. We not only produce physical sustenance; perhaps even more importantly, our souls are fed and strengthened by being surrounded by good people living good lives grounded in grace, generosity, patience, understanding, dissent, discovery. It is an honor to grow and learn to live more deliberately and fruitfully with you. Of course our gratitude must go beyond the work and love that people lavish on this place. The world, though we ignorantly abuse it, is a marvel of non-human magnanimity. The dependable rhythm of the seasons is a gift. Life abounds underfoot and overhead. The will to live, flourish and reproduce inexorably floods forth. Rains, though sometimes vicious and sometimes achingly absent, rather reliably water in seedlings and germinate seeds. The certainty and mystery of the sun and stars light the way. We abide on a beautiful place on earth, on a beautiful planet, in a mind-bendingly beautiful universe. We are blessed to behold the billion births and deaths, the cycle of life that brings us food and compost, nourishment and sacrifice. Hunched over a patch of earth, inching down the row, head bowed to the ground, miracles abound, wisdom and delight for which no words can be found. As we count our own blessings, our hearts go out to those destroyed by drought, razed by storm, drowned by flood, broken by violence. Our climate creeps towards chaos, and, though we were spared from destruction this time, we are no less vulnerable and no more just. As we celebrate abundance, we think of those suffering through scarcity. It hurts to think of having hungry children and no good food to eat. We can’t be satisfied with our own private plenty. We are all seated at one big table. Let there be enough for all. Sometimes when planes or helicopters pass overhead or neighbors blast their fireworks, I try to imagine (as if I can) farmers who must cultivate under fear of bombs and landmines, in lands sickened by strife. Farming is hard enough as it is. I feel an unshakeable solidarity with the workers of the world and wish for us all a stable home, a lasting peace, a sense of dignity, a hope for the future. Thanks again for your support this year. We appreciate your commitment to a saner, simpler, slower, more delicious world. The earth has been good to us, and, with your help, we do what we can to reciprocate. We hope you had a positive CSA experience and welcome any feedback. Best wishes of health and happiness through the winter and beyond. Look forward to seeing you soon and starting back all over again before too long. You are currently browsing the A Place on Earth Csa Blog blog archives for October, 2015.